Our world class computer technology and modern workroom allows us to offer our custom drapes at the best prices in this industry. We are strictly an internet retailer. We do not have showrooms, outside sales people or retail locations adding to our overhead. This allows us to offer our high quality custom drapery at substantially lower prices. 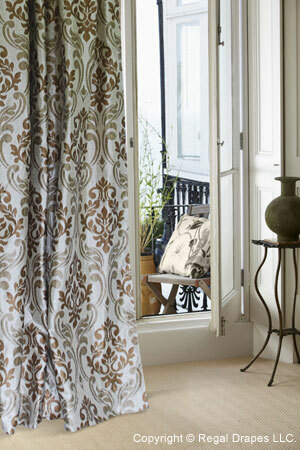 At Regal Drapes we leverage the internet and technology to make buying custom drapery a simple task. Start with a few simple measurements and we will help you with the rest. We created a simple process to size out and order custom draperies with little effort. We craft all custom draperies in our state of the art workroom in New Jersey. This allows us to have full control over the process and ensures the highest quality product for our customers. Best of all we can ship out your custom drapes within 3-7 business days of purchase. We pride ourselves in providing world class customer service and support. Our Satisfaction Guarantee comes with a 100% Refund Policy, something no other custom drape manufacturer offers. Over a third of our orders come from referrals keeping our marketing costs down. We follow a simple philosophy “Make the customer happy and they will tell their friends”. See what our customers have to say.